Essential Phones’ very first mobile device called the Essential PH-1 is now receiving the latest May 2018 Security Patch. 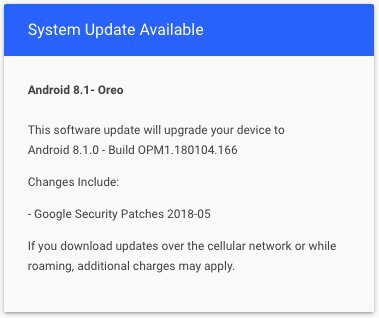 This OTA update is now rolling out across the globe with firmware build number OPM1.180104.166 based on Android 8.1 Oreo. Just today, Google released the May update for Pixel and Nexus devices and also updated the AOSP sources. Essential PH-1 becomes the first device to roll out the latest security updates. The OTA downloads, factory images, and even the stock firmware packages are now available for downloads and readily flashable via stock recovery, ADB sideload, or Fastboot methods. Essential Phone also has a parallel Oreo Beta program which comes with the latest features and bug fixes. You can sign up for the Oreo Beta for Essential Phones from here. The Twitter handle of Essential Phones recently tweeted about the latest OTA update for its first device. So what’s new with the Essential Phones December Patch? The changelog simply states the firmware build number and the security patch version. So it is a small update which weighs 91.5 MB in size. The OTA update has been captured and listed here. The list consists of incremental OTA updates, full stock firmware builds, and factory images. The following is for the Open Market / Sprint / Telus variants of Essential Phone based on Android 8.1 Oreo (OPM1.180104.166) with May 2018 Android Security Patch. This is the best way to update your Essential Phone to latest Android 8.1 Oreo. Read: How to install OTA updates? OR, see the essential phones’ very own tutorial. Download Essential Phones factory images can help you restore to complete stock. For devices on the Sprint or Telus carriers, don’t worry, we have the factory images for you too. The May update is currently for the unlocked, global variant and also for the Telus or Sprint can make use of the factory images to update their phones to the latest available firmware. Read: How to flash factory images? Note: You will need to first unlock the Bootloader by using the command fastboot flashing unlock in bootloader (THIS WIPES USER DATA, BACKUP BEFOREHAND). Critical partition unlocked: run the command fastboot flashing unlock_critical in bootloader (THIS WIPES USER DATA, BACKUP BEFOREHAND). Download full stock Firmware packages. This can be useful in order to update your Essential phone on a rooted phone. These are the full stock firmware used by Custom ROM users to restore. Essential device driver for Windows machines. Supports 32/64 bit on Windows 7, 8 and 10.